On December 12, 1831, Sister Catherine McAuley founded the Sisters of Mercy in Dublin, Ireland. A devout Irish Catholic laywoman fiercely dedicated to helping others, she started the first House of Mercy, which provided shelter and education to underserved women and girls. Almost exactly 150 years later, another determined Sister of Mercy started her own legacy. Sister Timothy Marie O’Roark, a legal aid attorney in Omaha, Nebraska, appealed to the Sisters of Mercy in Omaha to adopt affordable housing as a sponsored ministry. They accepted her proposal, and on Christmas Eve, 1981, Mercy Housing was incorporated as a Nebraska nonprofit. 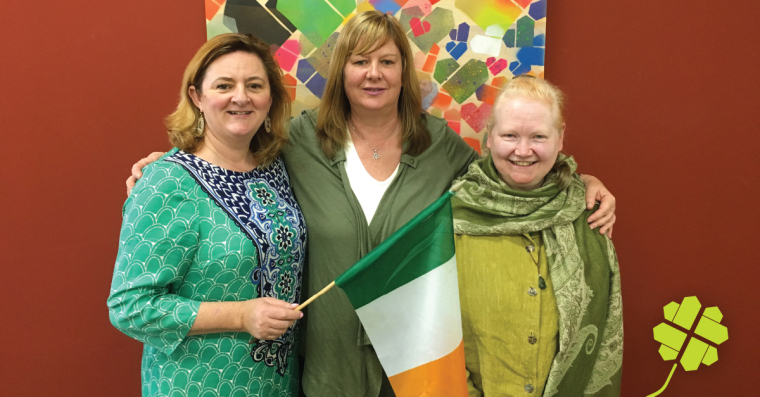 On this St. Patricks’ Day, we celebrate our organization’s Irish Catholic roots by interviewing three Irish employees about what the holiday means to them! Favorite part of working for Mercy Housing: I like the diversity of tasks, the people I work with, but I especially love being part of the mission – and seeing the real results of our work over and over again. Favorite thing about St. Patrick’s Day: That so many people around the world celebrate it! Favorite part of working for Mercy Housing: My support system, namely Samantha Hogg, my supervisor. I work with amazing inspiring people. Favorite Irish tradition: Whenever I am in Ireland it’s Lent, so I get up to go to Mass, meet friends, and then walk in the St. Patrick’s Day parade with my family and friends. Then we have a big dinner which usually is boiled ham, potatoes, and vegetables. Favorite thing about St. Patrick’s Day: My favorite thing is to celebrate my family here in America. Just like St. Patrick, who was an immigrant to Ireland. I celebrate that with my American family, which is made up of all races and creeds. I take my two daughters Claire Francis and Gladys to Mass, breakfast (at Foleys Irish Pub in San Francisco), and we go and view the parade. Favorite part of working for Mercy Housing: Helping people move into our housing. On move-in day, when I give them the keys to open the door of their new home, I love seeing their eyes light up and the joy on their faces. Favorite Irish tradition: For seven years I lived in a Mercy Housing building while I was managing two senior communities. Every year, on St. Patrick’s Day, I made all my residents Irish stew and I also entertained them with my Irish dancing. Now I cook Irish stew for the staff I work with! Favorite thing about St. Patrick’s Day: Watching everyone be Irish for the day and wearing green and having “the craic,” which means “fun” in Ireland! Answers were edited for brevity and clarity.